At Enter CIC we provide opportunities for all irrespective of age or background. We currently provide a number of services in County Durham that cater for any individuals with an interest in performing arts or for those who are simply looking to do something different in their daily life. Young people that attend Enter CIC have noticed an improvement with their confidence and have gained valuable life skills. Please see the table below for our current weekly sessions. We provide opportunities in all aspects of Performing Arts. Dance, Speech & Drama, Examinations, Music, Singing, Guitar, Drumming, African Drumming, Keyboard, Musical Theatre, Media, Art, Production Skills. At Enter CIC we feel it is very important for our young people to get the most out of their time with us. Young people who work with us receive once in a lifetime opportunities to perform on the biggest stages. Recently our young people have performed at the Gala Theatre, Durham, Sunderland Empire and in September 2013 we will be performing at Durham Cathedral. Our students regularly work with West End professionals and TV personalities. Through work experience placements (provided by Enter CIC) our students have travelled to London’s West End to work on Spamalot and Dreamboats and Petticoats and worked on the get in for Matthew Bourne’s Sleeping Beauty at the Theatre Royal, Newcastle Upon Tyne. We have a number of students who work on our production team. 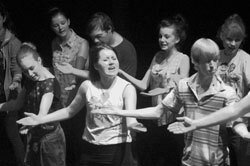 Students gain experience in live theatre productions and our own in house productions. 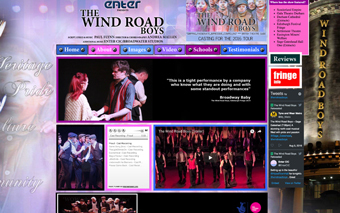 Recently our students have worked on our production of The Wind Road Boys at the Gala Theatre, Durham. One student ran the whole sound for the performance which is usually done by a sound technician and another found himself involved with the stage management. Inclusivity is of paramount importance to Enter CIC. We are passionate in our belief that the world of artistic and creative activities should be open to all irrespective of age, ability, or complex learning requirement. We have witnessed first hand how young people with specific needs benefit from our programmes. Our ability to acknowledge and fully comprehend that everyone learns differently is key to our success. When we devise programmes we try to identify the preferred learning style of the individual and then we try to centre the programme around this learning requirement/preference. We have successfully integrated young people with specific learning requirements into our mainstream programmes. For some young people this is not possible and a one to one approach is required. 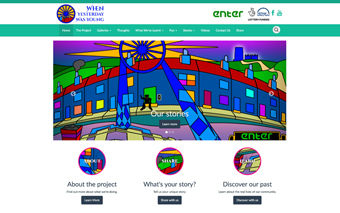 All of our programmes are open to young people of all abilities. Our Zumba fitness sessions are one hour of non stop action and a great way of keeping fit. No dance experience is necessary. A fun, magical and educational class jam packed with interesting ideas to help the development of your child. 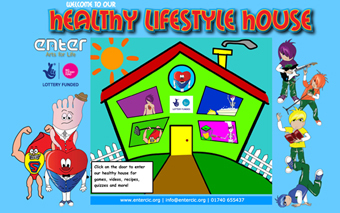 This project is designed for parents, carers and childminders who look after children on a daily basis. This is a perfect programme to help prepare your child for school or nursery. One to one sessions for drummers of all abilities. Sessions are 25mins. One to one sessions for guitarists of all abilities. Sessions are 25mins. It’s not just for young people, we have a number of volunteers and licensed chaperones working with us. Got any spare time? give us a call and join our volunteering programme. If you are interested in joining Enter CIC, please call us on 01740 655437 or email info@entercic.org. Please call for prices.